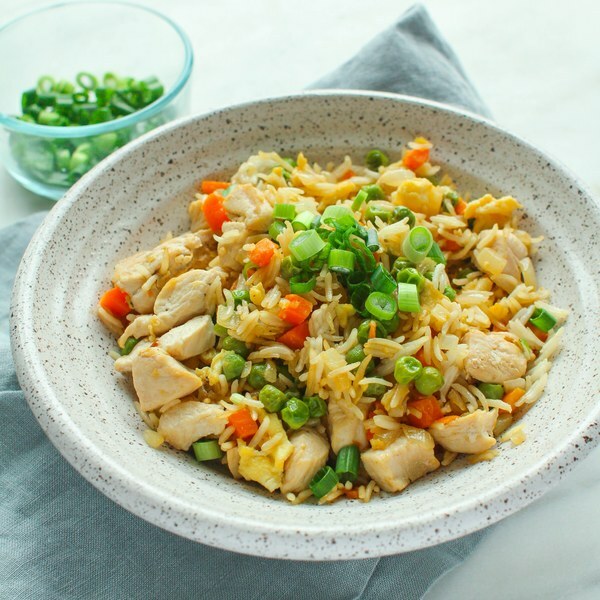 ← Better Than Takeout Chicken Fried Rice. Using a strainer or colander, rinse the rice under cold, running water, then drain and transfer to a small saucepan. Add water and bring the mixture to a boil over high heat. Peel and mince garlic. Peel and small dice onion. Wash and dry carrots and green onions. Peel and small dice the carrots. Trim root ends and chop the onions. Measure out peas. Coat bottom of skillet with oil. Add chicken and, stirring occasionally, cook until cooked through, 2-3 minutes. Transfer to a plate. Return skillet to stove, increase heat to medium-high, and add more oil. Add garlic, yellow onion, carrots, and peas to skillet. Stir fry until tender, 2-3 minutes. Move vegetables to one side of the skillet and pour eggs on the other side. Scramble eggs until cooked and mix with vegetables. Add rice, chicken, and soy sauce to vegetables. Stir until well combined and heated through, 1-2 minutes. Remove from heat and sprinkle with green onions. To serve, place fried rice in a bowl. Enjoy!